Donna Gephart's first novel, As If Being 12 3/4 Isn't Bad Enough, My Mother Is Running for President! won the prestigious Sid Fleischman Humor Award. Her new novel, How to Survive Middle School, received starred reviews from Kirkus and School Library Journal. Olivia Bean, Trivia Queen, about a girl determined to get on the TV quiz show Jeopardy!, is due out in March 2012. Ella Minnow Pea by Mark Dunn. This epistolary novel is one of the most clever I've read. It was recommended by my 10th grade English teacher, with whom I still keep in touch. In this book, a tiny island nation pays tribute to the creator of the phrase: "The quick brown fox jumps over the lazy dog." A statue with these words falls prey to time and weather and letters begin to fall off. Residents of the island are then not permitted to use those letters in their correspondence. It's fun to read the correspondence as fewer and fewer letters of the alphabet are used. The Absolutely True Diary of a Part-Time Indian by Sherman Alexie. This somewhat autobiographical novel dances the line between heartbreaking and hilarious. Junior Spirit is torn between two worlds when he makes the long trek every day to attend the "White" school with more opportunities instead of the "Indian" school on the reservation where he lives. The prose are sparse. The details gritty. A magnificent book. A Crooked Kind of Perfect by Linda Urban. Zoe Elias's dream of becoming a famous concert pianist is turned upside down when her father brings home a Perfectone D-60 wheezebag organ instead. 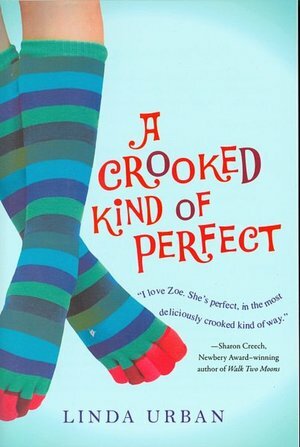 Quirky, believable characters and perfect details make this an enduring novel for young readers. Mrs. Biddlebox, written by the late Linda Smith, illustrated by Marla Frazee. The author wrote this while struggling with cancer, and she captures the essence of a gloomy day with delicious rhyme and a hopeful ending. The illustrations add depth to the already meaningful story. This story will allow young readers to feel understood when their moods are less than chipper. Visit Donna Gephart's website and blog.